The "Romance Staircase" in the Marble Hall of the NMAI, modeled after the Petit Trianon (1762) at Versailles. © 2016 National Museum of American Illustration, Newport, RI. www.AmericanIllustration.org. From stunning scenery to its rich history, Newport is known for many wonderful things. So many things, in fact, that some of its most alluring attractions get lost in the mix. One of our favorite lesser-known spots to see and be seen in Newport? The National Museum of American Illustration (NMAI). Let’s take a closer look at this world-renowned destination, and why it’s worth a visit on your next trip to Newport. The Rose Loggia of the NMAI, in which six of the 18 Florentine Fete panels by Mayfield Parrish are hung. © 2016 National Museum of American Illustration, Newport, RI. www.AmericanIllustration.org. 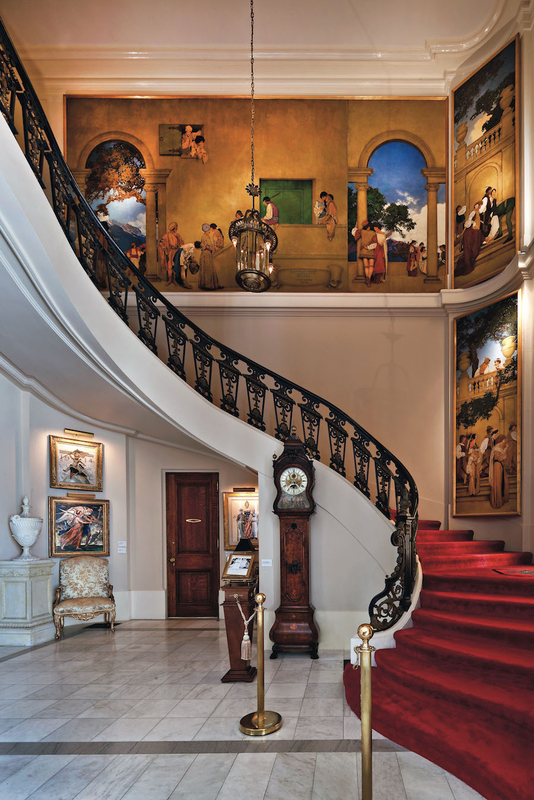 Reserve a private tour; explore the American Imagists Collection, exhibitions and events at your own pace; or stroll through the museum’s magnificent gardens and parks, including a majestic marble terrace, dramatic sunken garden, luxurious rose garden, and many other sensorially immersive vistas. And really -- where else but glamour-soaked Newport will you find gardens inspired by those of the ill-fated Anne Boleyn? MISS LIBERTY by Norman Rockwell (1943). Oil on canvas. Saturday Evening Post cover for September 4, 1943. © 2016 National Museum of American Illustration, Newport, RI. www.AmericanIllustration.org. In addition to its permanent collection, NMAI’s also plays host to a compelling parade of exhibits, including this summer’s “Norman Rockwell and his Contemporaries” (until September 4). We’re all familiar with Rockwell’s inimitable Saturday Evening Post covers. The exhibit pays homage to the cultural and historical significance of Rockwell’s quintessential American scenes, while also highlighting the work of his Golden Age contemporaries, including John Clymer, Stevan Dohanos, John Falter, George Hughes, and Mead Schaeffer. 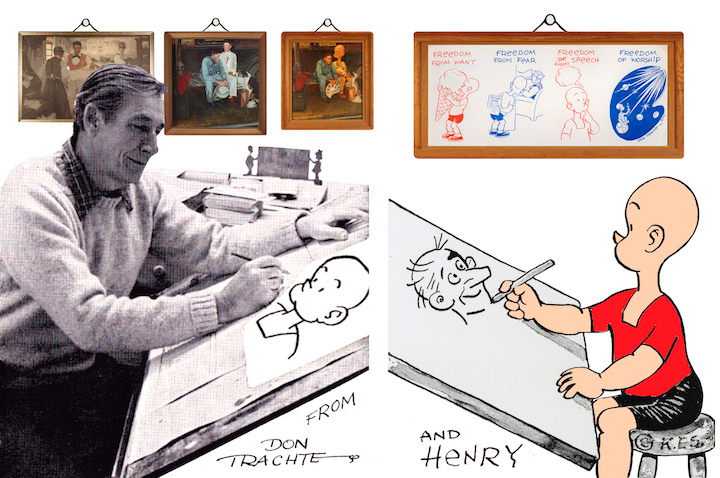 Don Trachte sketches opposite comic strip character Henry. Tract took over the Sunday strip in 1946 and continued to draw Henry until 1993. © 2016 National Museum of American Illustration, Newport, RI. www.AmericanIllustration.org. Perfect for both the young and young-at-heart, meanwhile, is “My Little Pony: Under the Sparkling Sea By Mary Jane Begin” (until September 4), which depicts the “impeccable storytelling ability and extraordinary artistic skills,” of the aquatic-inspired artist tasked with writing and illustrating the newest book in the My Little Pony series. 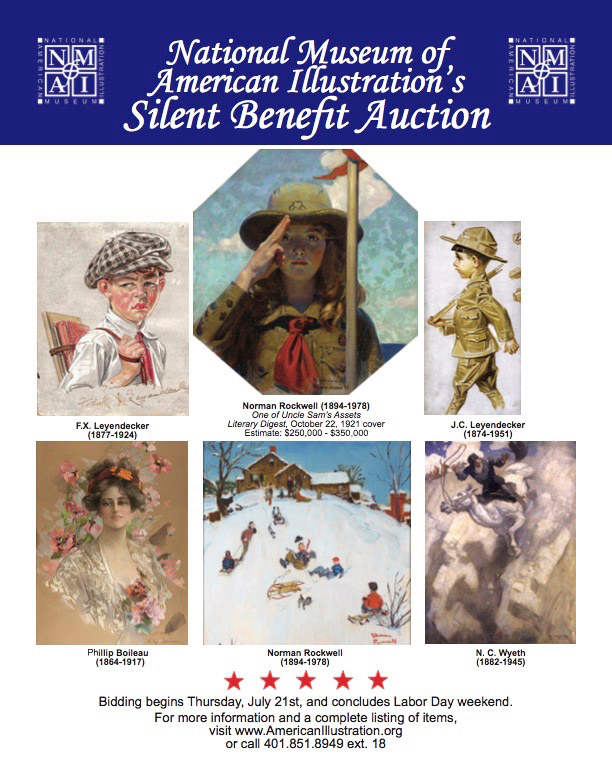 The NMAI will begin accepting bids for the 2016 Annual Silent Benefit Auction on July 21st. Bidding concludes on Labor Day.© 2016 National Museum of American Illustration, Newport, RI. www.AmericanIllustration.org. But why end your quest for culture in Newport with NMAI? Enjoy equally iconic accommodations and artful fine dining at The Chanler and The Spiced Pear.